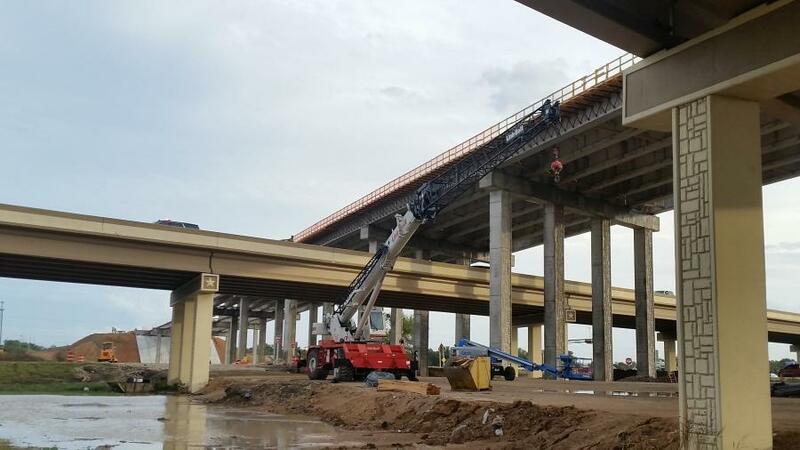 Crews from McCarthy Building Companies Inc. began work on a $149 million Texas Department of Transportation's (TxDOT) SH 71 Express project in January 2015. The toll lanes are scheduled to open to travelers in the Austin area in October 2016. This is a key road for area traffic and in addition to day shifts, work is being done at night and weekends to minimize the impact on traffic. “The project is dedicated to improving long-term mobility in Austin,” said Emily Riggs, public information coordinator for the SH 71 Express project. “State Highway 71 is one of Austin's most important roadways connecting drivers to the Austin-Bergstrom International Airport (ABIA), the city of Bastrop, and other central Texas communities. The purpose of the project is to enhance safety and reduce congestion and travel time along this corridor. The bulk of the work is a 3.9-mi. (6.28 km) limited-access toll road — one lane in each direction — beginning at Presidential Boulevard, near the airport and extending east, ending at SH 130 near Onion Creek. The project will include two new toll lanes, new bridges over FM 973 and SH 130, and ramps between toll lanes and the main lanes of SH 71 and SH 130. In addition, Presidential Boulevard and FM 973 will be widened. The Central Texas Regional Mobility Authority, an independent government agency created in 2002 to improve the transportation system in Williamson and Travis counties, is responsible for the toll road. The expanded highway, a project funded by the federal and state government, is needed as traffic in the project area has increased by 158 percent since 1990. The project is expected to reduce travel time by 16 percent in 2016 and 54 percent by 2026. When completed, the road will be able to accommodate 105,000 vehicles per-day (west of FM 973). The express project is one of several improvements intended to complete a highway upgrade to SH 71. A workable traffic plan was needed to minimize the impact on traffic and to protect the construction crews. To this end, TxDOT's Public Information Team keeps the public informed via a Web site, a hotline, various announcements, E-Newsletters and press releases. The team developed an extensive traffic control plan to minimize impacts to motorists and pedestrians. This includes working night shifts to set traffic controls and barriers for the following work day and to drill the deep foundations for the bridges, and employing smaller pieces of equipment, such as low overhead clearance soil nail drilling equipment, to work in tight spaces and minimize the need for lane closures. 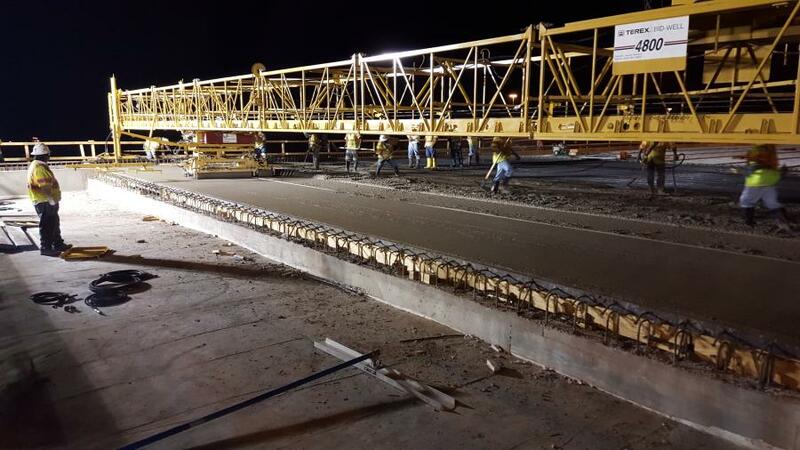 McCarthy has been working closely with its design partner Lockwood, Andrews & Newnam Inc. (LAN) to develop the most cost-effective design solution for the project and has completed numerous similar reconstruction projects under heavy traffic conditions in Texas. There were two major design challenges that had to be overcome according to LAN. Building the toll lanes in a busy corridor required navigating several issues and foremost among them was minimizing utility relocations and service interruptions. To discover potential conflicts, the project team generated a 3-D geometric model, developed by DTM-Solutions using Microstation software, and visualized the design. Native soil condition was another. Expansive clay soils, prevalent in the east Austin area also created challenges. The soils in the project zone have plasticity indices (PI) ranging from 29 to more than 50, well above the design team's target for the subsurface conditions under the toll lanes. High plasticity soils have substantial shrink-swell potential with changes in moisture content and samples were taken 8 ft. (2.44 m) below the travel lane and required a PI of a weighted average of 25 or lower. When PI was too high, McCarthy over-excavated and replaced with a select fill of low PI materials. 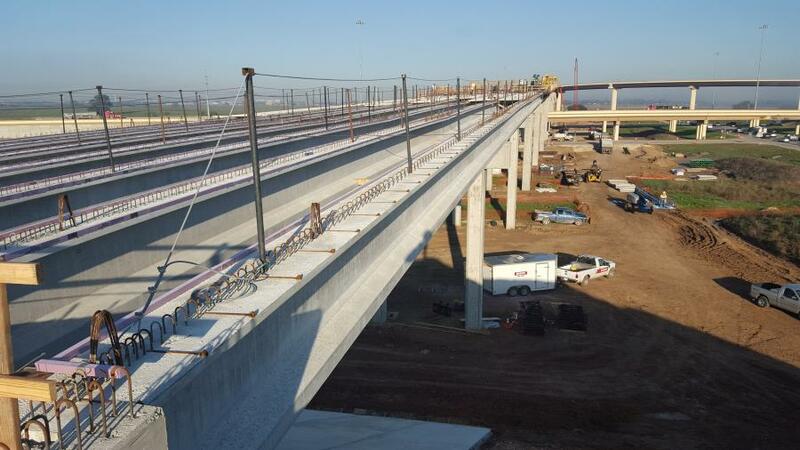 By the end of 2015, McCarthy completed the SH 130 overpass structure, eastbound Onion Creek Bridge widening, FM 973 realignment and intermediate switches, segments of shared use path, and temporary shoring walls at Presidential and Spirit of Texas. In 2016, the primary focus will be on the following: new SH 71 EB Frontage Road opening, new FM 973 overpass and new managed toll lanes, Presidential widening, Presidential intersection site work and hardscape, westbound Onion Creek reconstruction, completion of shared use path and sidewalk, completion of Spirit of Texas retaining walls, completion of FM 973 realignment, and startup of tolling/ITS systems. McCarthy crews relocated many of the utilities, with their cooperation and approval, with Texas Gas being the exception, which hired its own preferred contractor. Billows, via solid pre-planning and planning, had been able to anticipate nearly all of the challenges and develop solutions for them. The year-round work has an average of 150 workers on site daily. Weekly meetings are held with the subcontractors to coordinate work, which is bolstered by daily interaction. Working at night is not easy, but Billows is doing his best to minimize the impact on the crews. Safety, be it at night or day, is a priority and individual crews have daily safety briefings prior to the start of the shift. A monthly job-wide safety meeting is held and occasional weekly meetings are scheduled depending upon the work. The new bridges being built are concrete girder bridges, with the main structure being 3,000 ft. (914.4 m) long and the second longest 450 ft. (137.7 m), while a number of existing 200 ft. (61 m) long bridges are being widened. 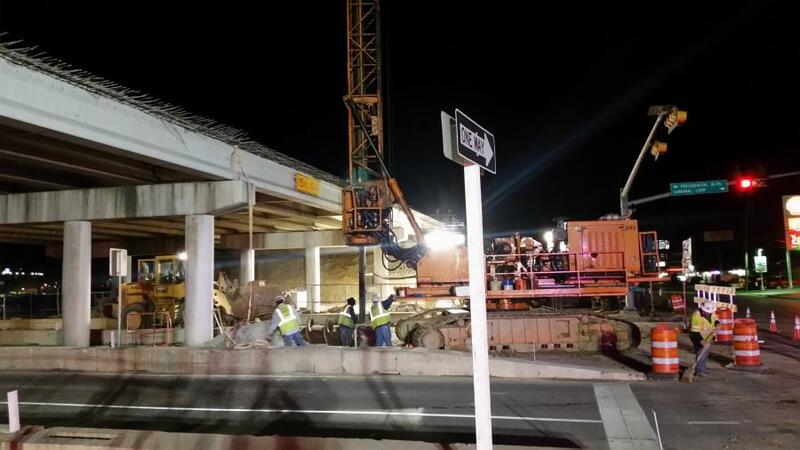 In addition to netting to prevent debris from falling onto the highway, much of the bridgework is done at night, which allows for road closures beneath areas where the work is ongoing. This makes the cutting of deck panels and placement of overhangs much easier. Billows and his crews take nothing for granted when building bridges and are employing practices learned on previous bridge projects. It is the same for roadwork, which has some of the toll lanes and general purpose lanes based on standard asphalt pavement designs and concrete paving for the roads between the bridges and elevated structures. Because space is tight, materials are delivered on a just-in-time basis. When completed, McCarthy will have removed 6,000 cu. yds. 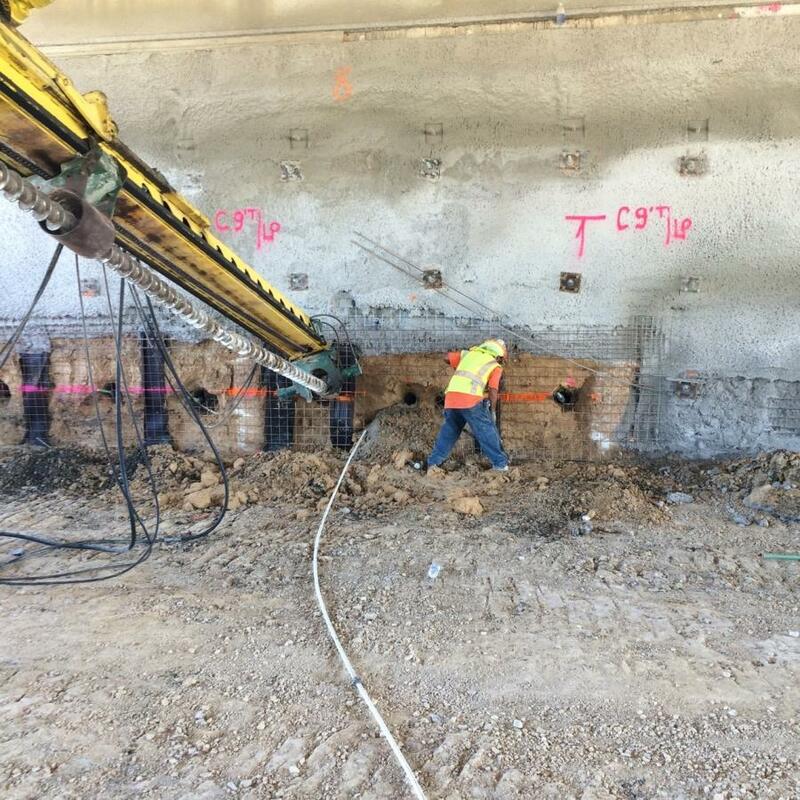 (4,587 cu m) of concrete and 1,000 cu. yds. (764.5 cu m) of asphalt. When completed McCarthy will have brought in approximately 40,000 cu. yds. (30,582 cu m) of concrete (cast-in-place) and approximately 95,000 tons (86,183 t) of permanent asphalt. In terms of equipment on site, McCarthy has a backhoe; an excavator and mini-excavator; a blade motorgrader; a cement stabilization mixer; compactors (padfoot, smooth drum, and pneumatic); cranes (mobile rubber tire and mobile crawler); dozers (D3 and D6); a loader; a forklift; a street sweeper; trucks (water, fuel and crash attenuator); and a welding machine. Billows noted that the equipment is a mixture of previously owned equipment, newly purchased equipment, and rented equipment. The firm's closest shop is in Houston, a fair distance from the project. A machine or vehicle after 500 hours of use undergoes more serious preventative maintenance. Equipment dealerships also are part of the maintenance plan, especially for equipment that is under warranty. A lot of McCarthy's newer equipment, especially the Cat pieces, have the electronic monitoring systems and they also are equipped with GPS systems. 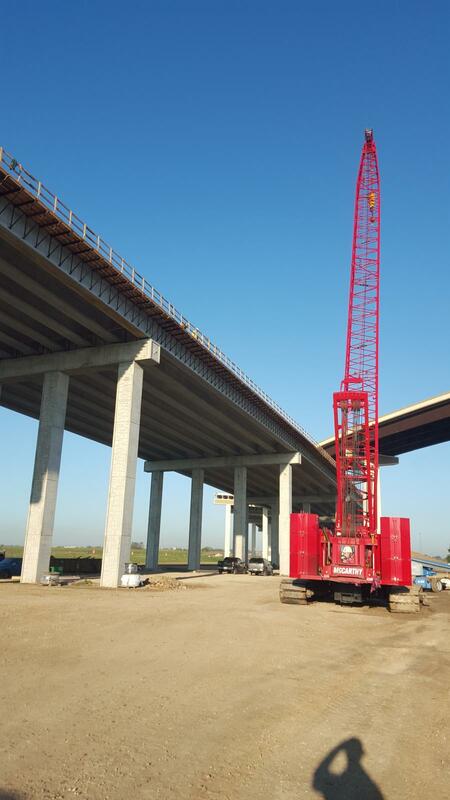 Billows, with 15 years of construction industry experience, appreciates the evolution of equipment and on this job, has benefitted from the sharing of crews and equipment from other McCarthy projects in Houston and Dallas.